NASA scientists have mapped the bottom of the Greenland ice sheet in order to better predict how fast in might melt due to future climate change. Two NASA satellites peering out over the Greenland ice sheet have helped researchers map areas thousands of meters beneath the thick, icy surface. The new map, created by NASA scientists, is the first of its kind and shows regions underlying the ice sheet that are likely thawed or frozen, as well as areas where the state remains unknown. This information will help scientists better predict how quickly the rest of the ice sheet will melt in the future, NASA officials said in a statement. 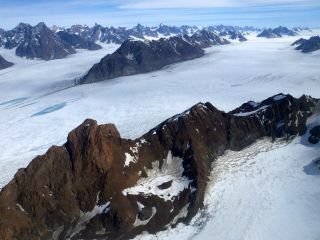 The bottom of the Greenland ice sheet is often tens of degrees warmer than the surface due to some geothermal heat that rises from deep inside the Earth. This heat causes some areas to thaw, while other areas remain frozen solid. This map illustrates what NASA scientists believe is happening at the base of the Greenland ice sheet. The areas marked in red represent areas that have thawed, while blue areas remain frozen solid. Insufficient data was available for a third section of the ice sheet, which is represented in grey. Until now, scientists relied on only a few, isolated boreholes (dug directly into the ice sheet) to study what was going on at the bottom. The researchers of the new work, however, combined multiple methods, including observations from NASA's Terra and Aqua satellites. Using images captured by these two Earth-observing satellites, the researchers were able to look for areas of rugged terrain, which generally indicate that ice moved over the surface and carved a trail in a thawed bed at the bottom, NASA officials said in the statement. The researchers also clocked the speed of the surface ice to see if it was exceeding its "speed limit" and moving exceptionally fast. That would mean the ice was no longer frozen to the rock beneath it, which would suggest the underlying area was thawed, according to the study, published July 23 in the Journal of Geophysical Research. The team also studied the individual layers of ice using radars onboard NASA's Operation IceBridge aircraft and used computer models to predict temperatures at the bottom of the ice sheet. Based on the new findings, the researchers determined that the southwestern and northeastern areas (shown in red) are already thawed, while the central and western areas (shown in blue) remain frozen. However, there is still not enough data to conclude what is going on under a third section of the ice sheet, which remains grey on the map. "I call this [new study] the piñata, because it's a first assessment that is bound to get beat up by other groups as techniques improve or new data are introduced," MacGregor said in the statement. "But that still makes our effort essential, because prior to our study, we had little to pick on."